The new Season of Gotham kicks off to what I can only describe as a pretty uninteresting and uneventful premier! Gotham is one of those shows in the Superhero TV domain that I really can't understand why it was ever made. It's supposed to be the story of Bruce Wayne before he becomes The BATMAN and why he actually becomes the comics legend! But it's NOT! I can understand why the shows producers are trying to depict the downfall of the city of Gotham and it's going to be the main reason why Bruce Wayne decides that the only way to clean up the City, is to become the vigilante, but really... it's so drawn out and it's becoming VERY tedious to watch not to mention the way they are introducing these villains of which some of them are pretty good, but my word... they're all going to be 'old men' before Bruce actually puts on the 'Cape and Cowl'. If indeed he actually does! For an episode that 'kicks off' an entire new series, you would think we would've been given an explosive episode, much like the introduction of 'Ghost Rider' in Agents of S.H.I.E.L.D”. Nope, instead we got a lack luster, boring 40 minutes odd of yet again 'Fish Mooney'... come on guys, do you really think we want to see any more of this 'dull' and 'tedious' character that lacks any excitement what so ever. The sooner this 'nondescript', flat and completely 'bland' character is killed off, the better! And if we see her wag that finger again, I think I'll throw something at my TV! So instead of something interesting that would light up the internet and make all BATMAN fans excited, we get a 'mundane' introduction to the 'Court of Owls', yet more ridiculous 'unhinged' violence by Barbara (How they are going to turn that one around into the character that should end up with Jim Gordon and finally have a child between them who should become BATGIRL, god only knows! ), an introduction to Vicki Vale's aunt, Valery Vale ... how ridiculous and predictable. BATMAN has Vicki Vale, now Jim Gordon has Valery Vale! Well I suppose in all reality BATMAN in this world is actually Jim Gordon! I think the producers thought that an introduction in the first 5 minutes of what looked like it may have been 'Killer Croc' may have excited the BATfans, although even he bites the dust... he's later described as being in 'pieces', so looks like we won't be seeing him again any time soon! And yet, he's one of BATMAN's main villains! What else, oh yes we get an appearance by what looks like the 'Green Hornet' abducting young Bruce Wayne, well that was 'thrilling' ... NOT! 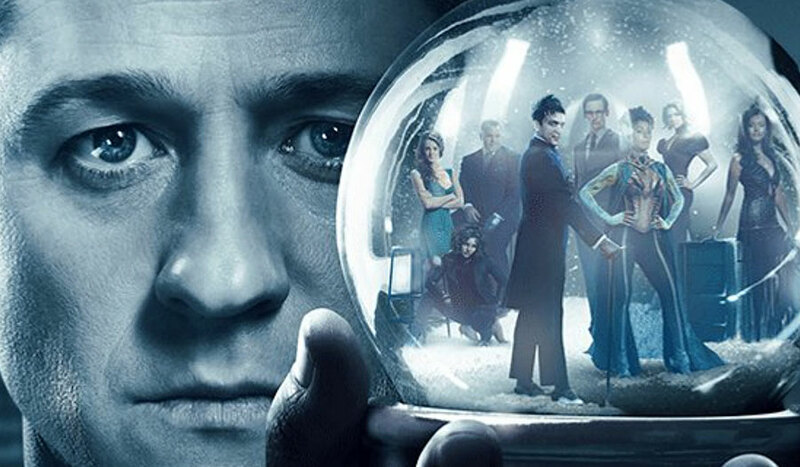 The only things that keep this show mildly interesting is the Penguin character, brilliantly played by Robin Lord Taylor and the Riddler also brilliantly characterised by Cory Michael Smith. The show 'comes alive' when these two are given screen time. Oh, I forgot one thing, that I think was supposed to excite fans .... it didn't! The appearance of a villain with concealed BAT wings, YAWN! Please don't tell me that the show is about to show young Bruce seeing this guy and thinks... oh, I'll become a BAT! Seriously, they'd better not or I'm out of here for good where this show is concerned!